This has been a monumental week for our family. We sent Harrison to sleep away camp for the first time last Wednesday. He’ll be gone for a month and he is, I am sure, having a blast. Me, well, I would be lying to say that I did not miss him desperately! So, this year the Fourth of July weekend seemed empty and just a touch sad in our house. I found myself feeling a little lost and a bit at sea as I planned dinner for us with dear friends on the 3rd. I realized that I was missing more than just Harrison- although that loss was palpable. I was missing the Fourth of my youth as well. Growing up I often spent the Fourth of July in the town of Duxbury, Massachusetts, at my Grandparent’s home. The Fourth there was an incredibly special event, not because of the sailing, beautiful beaches, golf and tennis galore (though that was all great!) but because my Grandparent’s house was very strategically placed for the Fourth. The front of their home stood directly on the parade route- and had a fabulous stone wall from which to perch and watch all the action- and the back of the house had a wonderful screened in porch with water views to see the fireworks that bloomed after dark over the harbor! Even as a child, I knew that The Fourth could not get better than this! The Fourth of July in Duxbury was always a multi-generational, multi-family affair-with Aunts, Uncles, cousins and family friends finding their spots at a huge dinner table. There was always corn, often lobster and certainly always steak. There was salad from the garden in the back or the local farm stand and then there was my mother’s incredible Strawberry Pie for dessert: a mixture of shortbread crust, crème patisserie and fresh strawberries- all covered with a yummy glaze. It was a sight to behold- and just as tasty! So, as I sat pondering my July 3rd dinner, my son at camp and my extended family scattered for the holiday, it was clear to me what I needed to make for dessert: my mom’s Strawberry Pie. If I couldn’t be with everyone, I could eat like I was! I made the pie and brought it to the dinner table. The table fell silent with the proper amount of reverence that such a beautiful (and very red) dessert inspires on the weekend of the Fourth. And, then we all dug in. The pie was delicious and with that first bite I found myself immediately transported to the Fourth celebrations from my youth. It was so comforting, so delicious and full of family lore that it was a true delight and the perfect antidote to my pangs. Mix together into an oily ball. Press into 9” pie pan. Using parchment paper and pie weights, bake for 12 minutes. Let cool to room temperature before filling. 1. Bring the milk to boiling point-but do not boil. 2. Beat the eggs with sugar until thick and light. 3. Gradually beat in the flour and cornstarch. 4. Gradually pour the milk into the egg mixture, beating until well blended. 5. Pour mixture back into pan. Stirring constantly, bring mixture to a boil over moderate heat. 6. Continue stirring and simmer 3 minutes longer until thick. 7. Remove from heat and add the vanilla. Chill. Mix sugar, cornstarch, corn syrup and water together in a saucepan and boil until thick. 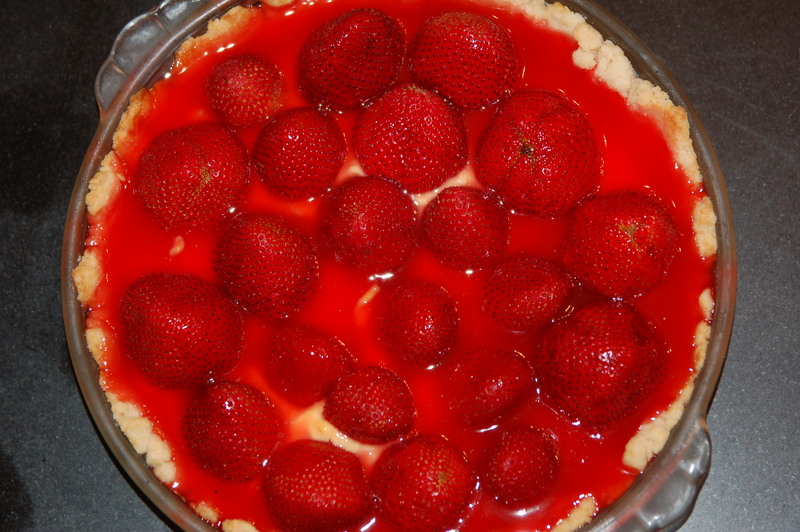 Take off heat and add strawberry Jell-O. Cool until warm. 1 QT strawberries washed and hulled and left whole. Place the crème patisserie in the piecrust. Cover the crème patisserie with whole strawberries and then cover the berries with the glaze. Chill pie until ready to serve. 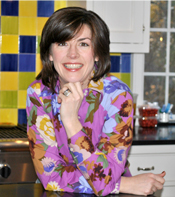 This entry was written by Caroline, posted on July 6, 2010 at 11:08 am, filed under baking, desserts. Bookmark the permalink. Follow any comments here with the RSS feed for this post. Post a comment or leave a trackback: Trackback URL.